Service For Peace is a global service learning organization connecting people to peace through service. 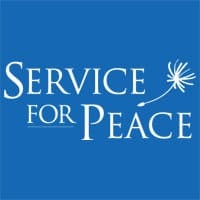 Service For Peace (SFP) began in 2002 when 300 international youth volunteers from across the United States, converged on Washington, DC, to participate in a summer program that involved a total of 40,000 hours of service and, according to the Washington Post, saved the District $400,000. This program later evolved into SFP Summer of Service, one of the many programs offered by SFP today. In 2007 Service For Peace engaged 5,074 volunteers in Louisville, KY; Bridgeport, CT; Miami, FL; and Chicago, IL. In addition, Service For Peace partners, and other chapter locations engaged a total of 70,744 volunteers in 891 projects in 17 cities across the country during the MLK Day Season of Service. Realizing the need for improving communities worldwide, Service For Peace has expanded into 27 nations, introducing people of all ages to the rewarding experience of bringing renewal to their communities and nations through service, learning, leadership development, and sustainable improvements. later evolved into SFP Summer of Service, one of the many programs offered by SFP today.